Movie Review: Hugo- Scorsese’s Cinematic Eye Makes This Dazzling Dickensian Tale Based on a Graphic Novel Visually Captivating | Generation Film! A complex piece of machinery has many cogs, wires, and gears that make it work efficiently for a definite and absolute purpose. This idea of purpose eludes many these days as we base our understanding of self on what we feel rather than on what we do. The theme that we are individual gears making this world work through either artistic or technical creations is at the center of Martin Scorsese’s new film, Hugo. Based on the graphic novel “The Invention of Hugo Cabret” by Brian Selznick and adapted to the screen by accomplished screenwriter John Logan (Gladiator, Rango, and The Aviator), Hugo is not only an incredibly poignant and heartfelt children’s film but it is also a dazzling feat in cinematic visuals that rivals anything Scorsese has done previously. Utilizing sweeping camera work, a mixture of real and digital sets, and a variety of old costumes and detailed art direction, Hugo is a marvel of visual storytelling that trumps its rather thin, yet paradoxically complex, plot line. The script’s authenticity to the graphic novel guides us through an intricate plotline that revolves around loss, purpose, and human connection yet doesn’t have a payoff that is equal to its circuitous journey. 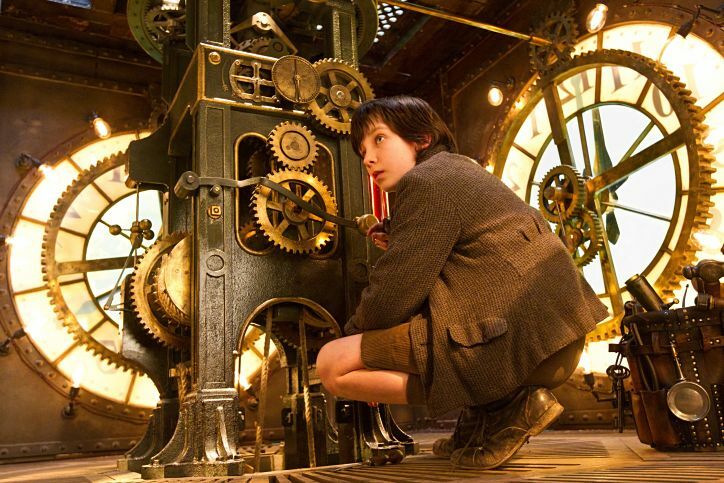 But putting minor criticisms aside, Hugo is a truly delightful children’s tale that sweeps its viewers into a visually detailed world of clocks, trains, machines, but most importantly, the movies. Scorsese is a true student of cinema and his admiration for its founders comes out in full throughout this children’s tale that leads us to a fictional history of French filmmaker Georges Méliès, played in captivating fashion by the great Sir Ben Kingsley. In the end these qualities make Hugo a unique blend of cinematic homage, heartfelt family film, and a Dickensian journey of loss and resolution that is complimented by extraordinary visuals that could claim the best and most fulfilling use of 3D. Opening the film is an awe-inspiring shot that is as long as it is beautiful as it makes its way through the outskirts of Paris in the 30s and travels through a busy train station and eventually reveals our protagonist, Hugo Cabret. Hugo lives in the train station where he keeps the clocks running efficiently in the place of his drunken Uncle who took custody of him after his father died in a tragic accident. What’s left of his father is an Automaton, a self-operating machine that resembles a human, and is the allegory to the plot’s central figure, filmmaker Georges Méliès. As the film jumps from Dickensian orphan tale involving a hardened train inspector (Sacha Baron Cohen) to revisionist film history study there is a fluidity that is uncommon in most films. Scorsese has the ability to give this children’s tale an additional layer, which is a love letter to the founders of cinema. This love is obvious as every shot, every sequence, and every set seems more detailed than the last. Yet the characters are not always as detailed as the story itself. There are, of course, a great amount of specifics for Hugo, the Train inspector, and Georges Méliès, but many of the side characters, even the immediate ones, just seem like circumstantial additions. But this tedious criticism, along with a sometimes relaxed pacing, is just hypercriticism for a movie that is ultimately incredibly delightful. Hugo brings out the best in Scorsese for two reasons, the first being his love for the movies as a student of cinema and the second is his newfound direction with children, probably because he’s a grandfather now and it gives him better understanding. Add all this with a script that is mysteriously multifaceted with a theme that is philosophically Aristotelian in how purpose, or what we do and its importance, is linked to human happiness. All of the characters, from Hugo to the Train Inspector to Georges Méliès wish to be important through their work and that is a virtuous lesson worth teaching children through cinema. Scorsese isn’t necessarily known for his sympathetic side since most of his films range from the grittily violent (Mean Streets, The Departed) to the personally troubled (Taxi Driver, The Aviator). But in Hugo we’re seeing a filmmaker who has mastered his abilities and can transcend being pigeonholed as a director of the violent and the disturbed. Though Scorsese has every technical expert and budget opportunities at his disposal, he uses it with a delicate and dazzling vision that is aesthetically impressive and undeniably poignant. The deep shots and meticulous sets are all complimented by the 3D technology, which is a refreshing deviation from having the 3D be the center of telling a story as it is in other films. While the plot is incredibly complex and delivered at a leisurely pace, there is no denying the incredible visual ballet that follows our lonely protagonist Hugo Cabret that showcases the true feats of modern digital cinema. Hugo is a children’s tale that tries to recapture the magic that old Hollywood used to embrace, which was that dreams were worth having and that they were elaborate, detailed, and relevant enough to be expressed to others. Thanks to John Logan’s devoted script and Martin Scorsese’s cinematic talent, Hugo becomes a rare family film that has a relevant theme about purpose, a throwback to the Dickensian spirit, and a loving homage to the founders of cinema.